The cut and dry way to gain muscle mass is to lift weights. Everyone knows that. But, there’s so many ways to add to your gains other than hitting the gym. Think outside the box. If you put Going to the Gym in your daily schedule, there’s no doubt that you’ll gain some muscle mass. But most of it has to do with what you put in your body along with the exercises you perform on a daily basis. Some say certain foods help more than other foods. And that is 100% true. You aren’t going to drink a 6-pack of beer and down a carton of ice cream and suddenly wake up to find your biceps have grown an inch. So, what foods will help you the most? Eggs are an excellent source of protein. They actually beat meat in this category. But how do they do this? 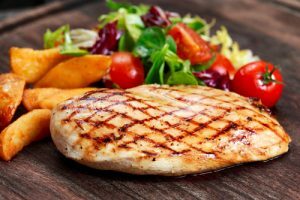 The leading experts all say that the protein you can gain from only a few eggs outweighs the protein you can obtain through meats. This rule is only valid so long as you eat a couple of yolks, of course. 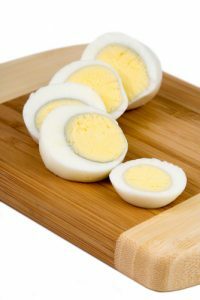 Eggs don’t only contain protein; they also contain vitamin B12, which helps breakdown fat and helps muscles contract. They also contain riboflavin, folate, vitamins B6, D, and E, iron, phosphorous, and zinc. And, health care professionals have ruled out the thought that eating eggs everyday increases your risk of heart disease. So go ahead and eat them up! Almonds actually supply the body with a great supply of alpha-tocopheral vitamin E. The body best absorbs this form of the vitamin. And, to boot, it’s an amazing antioxidant that helps prevent damage to your muscles after any workout, which in turn allows faster muscle recovery. For the best results, eat two handfuls of almonds per day. Chicken is a great source of high quality protein, especially when skinless. This protein is extremely important when it comes to muscle maintenance and repair, bone health, and even weight loss. It’s like the best of three worlds. And, don’t forget, there’s dozens of ways to make chicken tasty, including adding some olive oil, spices, and seasonings. This food source is not only a great protein for the body, but it also contains omega-3 fatty acids that help with protein breakdown, which aids in muscle recovery. In other words, this allows you to build muscle faster by storing new protein quickly. So, by the time your body breaks down all that old protein, it will already have a fresh protein supply waiting to aid in muscle growth. For quick, on the go salmon, look into salmon jerky. Beef jerky tastes good; Why not see if the standards are the same for salmon jerky? Yogurt is a phenomenal combination of protein and carbohydrates that someone trying to build muscle mass really needs. The protein and carbohydrates present in most yogurts allows muscles to recover and grow rather quickly. Don’t aim for the sugar-free yogurt here (they won’t be as beneficial to you). Instead, aim to buy the regular yogurt, perhaps with some fruit in the container. The extra carbohydrates in the fruit will help boost blood and insulin levels within the body, which will in turn reduce post-exercise breakdown. Any type of beef is considered an obvious protein. But, it’s much more than that. Beef contains iron and zinc as well, two ingredients that promote muscle growth to the max. 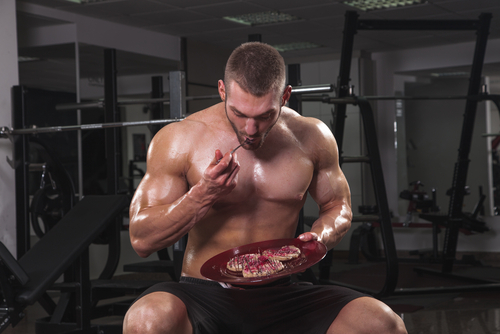 And, beef contains a great deal of creatine, which is your body’s energy supply when it comes to lifting weights. To focus on the protein aspects and avoid the caloric portions of beef, buy the “rounds” or the “loins,” and make sure that it’s lean, too. The “flat iron” cut will also do the trick. Olive oil is considered your liquid energy for building muscle. The monosaturated fat prevents the breakdown of muscle by lowering levels of what is known as sinister cellular protein. This protein is known to waste and weaken muscles. For the best results, grab extra virgin olive oil. It contains higher levels of vitamin E, which in the end will benefit you even more. All muscle is approximately 80% water, so it would only make sense to add water to your diet to improve muscle growth. Studies show that if your muscle water percentage is lower than this, you can actually impair your muscle growth. Highly hydrated muscles repair quicker and go through the protein synthesis process even faster. A good way to maintain a consistent water intake would be to jump on a scale before and after every workout. For each pound lost during the workout, have 24 ounces of water to gain back the water weight lost. That should put you up to par with hydration. It is said that coffee dehydrates the body. However, coffee is essential to gaining muscle mass for the simple reason that it gives you the opportunity to lift longer during your workouts. For the best results, drink a cup or two of coffee a few hours before your workout, not right before and not right after. The reason for this is that the caffeine will seep into your system and directly stimulate the muscles to work harder and more efficiently. Then, load up on water to make sure your muscles have the proper amount of hydration to continue growing. Try to incorporate a few of the items on the list to enhance your muscle growth. Combining these foods/drinks with a daily routine will have your muscles growing in mass within a short period of time. And, keeping up with both diet intake and workouts will ensure that you have constant muscle growth and healthy repair. There’s obviously other healthy foods you can incorporate in your diet, so pick and choose what works best for you.